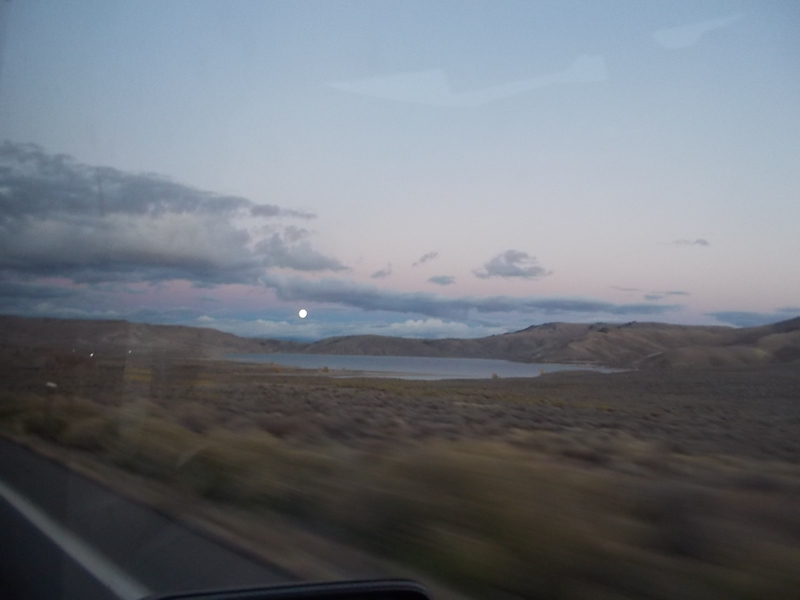 There was a gorgeous full moon hanging in the sky just above the mountains as we headed for Gunnison. Of course, the photo does not do it justice. It looked so big that you felt you could almost reach out and touch the huge orb. We were a little late checking into the motel, according to John’s timetable. It didn’t matter at all. We took a side trip to drive through Telluride. Over the years we’d heard so much about it that we longed to see it. I was amazed that so many of the houses were squeezed up – narrow homes of two and three stories jammed onto tiny lots. It’s a good thing there was plenty of mountain air, otherwise people would have been gasping for breath. Our motel room was just inside the back door and across a hallway from the lobby. Surprisingly, it wasn’t noisy. Perhaps we were the last guests to check in. My thoughts were, it will take about 10 steps to get to breakfast. Be sure to put on outdoor clothes, because this isn’t your own home. Before I opened my eyes the next morning, I was transported way beyond North Carolina, back to my childhood home. There was that very familiar smell of burned toast. I’ve talked about it enough that most people know my mother burned the toast on a routine basis. There I lay in a motel bed, thinking it was time to get up to go to school. But, wait! There was no scritch, scritching of Mom’s scraping the burned edges off the toast. This was a motel room, and I wouldn’t have to eat the morning burnt offering. I did not feel at home with the shower. At our age we are constantly on the alert for signs of irreversible aging. I’m beginning to think the first thing to go for me is the ability to deal with strange showers. The normal things were there – tub, faucet with a lever, and circular hardware for turning on the water and adjusting the temperature. There were no instructions. The silly thing had no color cues, either, so you didn’t know which way meant you’d scald yourself. I think the water pressure was regulated by pulling the lever, and the temperature was controlled by twisting. When things seemed right to my feet, I transferred the water to the shower head. I didn’t know I could jump and scream at the same time, but ice cold water shot out with great force. I wonder if the military has ever considered ice warfare. Soldiers could be immobilized by instant freezing wetness. While we’re on the subject of not feeling at home in a motel, I want to know who decided you need 5 to 6 pillows on a bed? It’s the in(n) thing now. OK, I can understand one under your head and one to hug, but 6 pillows for two people???? I did feel at home after breakfast when we opened the curtains. Light snow was falling, so I read the newspaper while John looked at email. We stayed at Gunnison two nights, one day being set aside for John to ferret out train history here while I caught up on email and blogging. This began to feel like a vacation instead of a fast paced tour. And maybe, just maybe, a nap in the afternoon!!!!! That would be the most homelike thing I could do away from home. One pillow for your head , one for you to hug, and one between your knees. That’s just a guess. Ha ha! Great guess. I had another thought — instant pillow fight! I had never realized people hug pillows. I thought we had two so your shoulder didn’t smush in on itself when lying on one’s side. Evidently many people have not paid proper attention to the art of the pillow. That’s much worse than anything that happened to me! it was an unusual sight…I just ignored it, but she activated the water …we were on a trip in Puerto Rico with a group from our community college.